John K. Crews, 48, of Frankfort, passed away on Thursday, May 18, 2017 in his home. 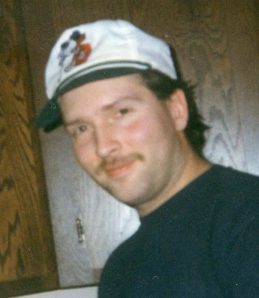 He was born on August 6, 1968 in Frankfort to James Bowers and Janice Lorene (Crews) Bowers. He married Edith Cheek on February 29, 1995 and she survives. John was a 1986 graduate of Frankfort High School and had served in the United States Army from 1987-1989. He worked for Donaldson’s in Frankfort for 8 years and had previously worked for General Seating and Frito Lay. He enjoyed watching and collecting movies especially horror films and Star Wars. He also loved to fish. Memorial donations may be made in John’s honor to the Salvation Army with envelopes available at the funeral home. Friends may visit 4-8 p.m. Monday, May 22, 2017 at Archer-Weston Funeral & Cremation Center in Frankfort. Private family services will be held Tuesday. Burial will be in Bunnell Cemetery. Surviving along with his wife Edith of Frankfort are his Mother: Janice Martin of Frankfort; Daughters: Emily Crews (Fiance: Jacob Grissom) and Sara Wills; Son: Walter (Wife: Megan) Wills; Sister: Terri Lynn Crews all of Frankfort; 5 Grandchildren: Haylee, Zak, Molly, Mia, and Johnathon. He was preceded in death by his father: James Bowers, his grandparents: Ernest and Florence Crews, and his favorite aunt: Patricia Crews. Thoughts and prayers going out to You, Sara ….. So very sorry for your dad. GOD BLESS YOU!! So sorry to hear of John’s passing. Went to school with John. Praying for the family. So sorry to hear about John passing away, I went to school with him. Prayers to his family. Terri and family, I am so sorry for your loss. Hugs and Prayers for comfort. while you’re going through this difficult time. Sorry for your loss Edith! Prayers for comfort for you and your family at this difficult time. May the comfort of our Lord be with you, Edith. Prayers to the family during this difficult time. Edith and family, I am praying that God’s love and peace will surround you at this difficult time. Edith and kids I’m so very sorry for your loss, love you all very much. if you need me I’m a phone call away. So sorry for the loss of you Dad. God Bless and Comfort you and your family. Your in my prayers. Love you. Edith I am sorry for the loss of your husband. I will keep you and your family in my prayers! Janice,I am so sorry to hear about this…I lost a son too,in 2003.. Haven’t seen you since that nite in Kokomo..If you would like to chat,look me on on Facebook and message me…..Love you Cuz,Becky…..